We’ve been reviewing a lot of entry level printers lately. The reason for this is that entry level printers are usually monochrome and that allows us to cover a whole new category. The KYOCERA FS-1325 also falls in that category i.e. an entry level monochrome laser multifunction printer. This means that it will give you the option of printing, copying, faxing, and scanning, all in one device. 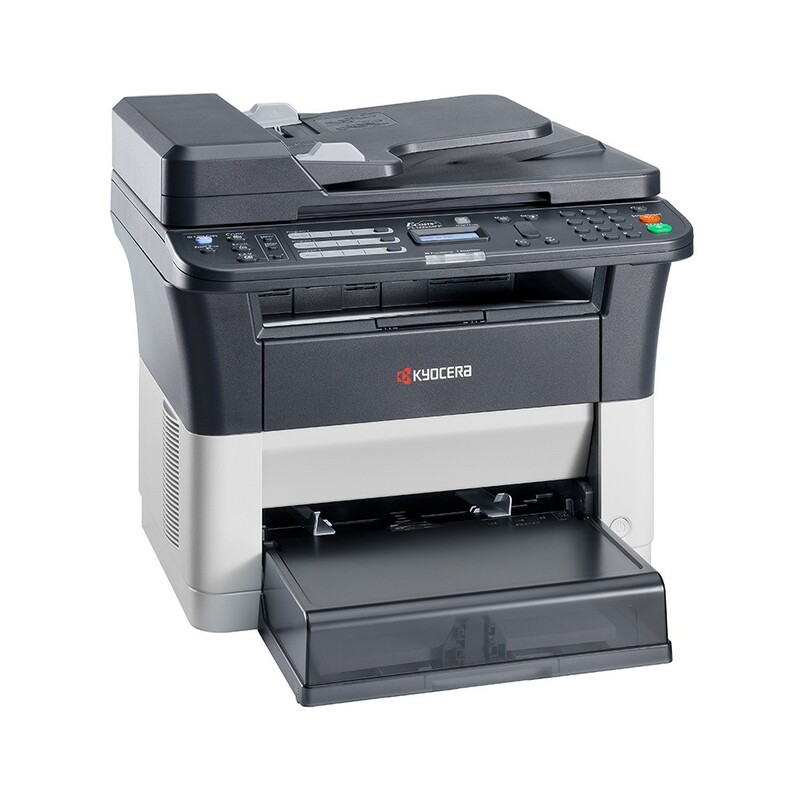 Like all entry-level monochrome printers, the KYOCERA FS-1325 is also targeted at the Small Office / Home Office (SOHO) segment. This also means that it is a fairly basic multifunction printer. The feature set of this device reflects its entry level category and basic nature. Therefore, if you need an office printing device that can perform multiple functions without requiring a large investment, you may want to consider the KYOCERA FS-1325. If that interests you, then here’s a review of KYOCERA FS-1325 that should help you make a decision. The KYOCERA FS-1325 takes cognisant of the fact that its target audience is financially restricted. As a result, it is designed to give its users as much as possible for as little as possible. This is mostly reflected in its running costs. With this printer loaded with Original Equipment Manufacturer (OEM) cartridges, you’ll spend about 4.32 cents for every page you print. However, you can cut down on that cost even further by using reliable generic cartridges instead. Using generic cartridges will mean that you’ll only be paying 4.18 cents per print. Like most entry-level monochrome lasers, this printer is also simple and basic structurally. It is compact and largely has a small footprint. It measures about 390mm in width, around 361mm in depth, and approximately 362mm in height. The colour scheme KYOCERA has chosen to use with this device is also simplistic in a combination of black and white. The KYOCERA FS-1325 only weighs around 10.1 Kg which means that most owners would be able to move it around singlehandedly. 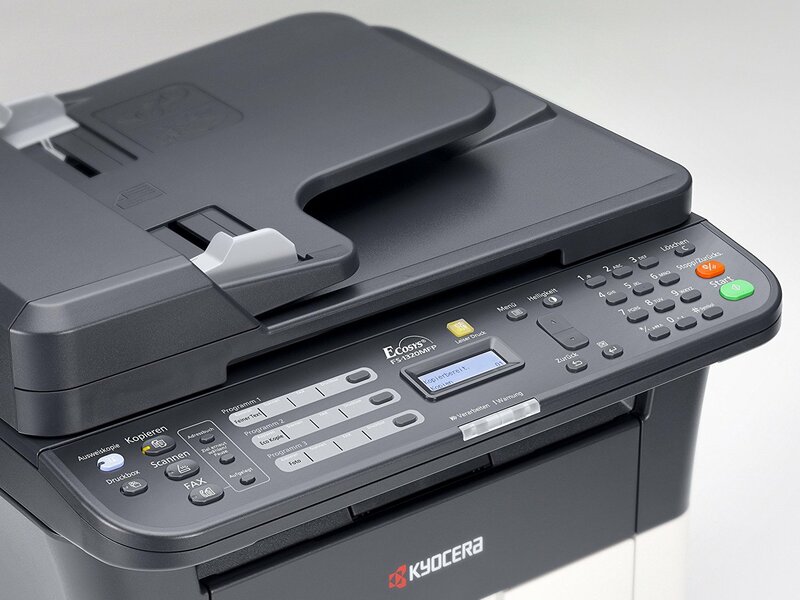 One of the more important benefits of owning the KYOCERA FS-1325, however, is that it is one of the faster multifunction printers in its product segment. This device can print at a very good speed of 25 pages per minute (ppm). Another advanced feature that you’ll find in the KYOCERA FS-1325 is automatic duplexing. Automatic duplexing can come in very handy if you want to cut costs as it allows the saving of paper and energy both. If you combine automatic duplexing with this printer’s Eco Print mode, then you stand to save even more because the latter helps save toner. Finally, the KYOCERA FS-1325 will also help you save money on maintenance. Not only does it support high yield cartridges but this device also boasts of a particularly durable print drum. KYOCERA has used its patented ceramic print drum which has a guarantee for the entire lifetime of the printer. The drum in question is rated to print up to 100,000 pages over its entire lifespan. While the benefits of the KYOCERA FS-1325 are considerable, something that might give you a pause when you go to purchase it is its initial cost. The initial one-time investment that this device requires is slightly higher than most other devices falling in the same product segment. At the same time, though, this machine does have some features that you won’t find in most entry level devices. A bigger issue might be the output quality of this device. The KYOCERA FS-1325’s prints are average at best. It is rated to print at a maximum resolution of about 1200 x 1200 dots per inch (dpi) but its output is still a bit too light. This lightness gets even worse with the Eco Print mode active. Another flaw of the KYOCERA FS-1325 is that it doesn’t offer Wi-Fi Direct as a feature. This feature is common in most modern day printers, irrespective of their segments. It is beneficial because it enables mobile printing. 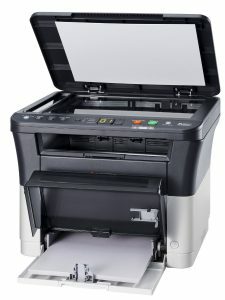 Along with the overall output quality, the functionality of this multifunction printer also suffers because of its paper path. It has a decidedly curved paper path, which means that when the paper comes out, it is slightly curled. This can bother some users, especially when the time comes to archive or present the sheets to outsiders. Also, we mentioned that this printer is compact and has a small footprint in the previous section of this post. However, it only remains compact till the output tray is folded. Once the output tray comes out, the footprint of this device gets annoyingly large. There are a few other problems with the KYOCERA FS-1325 too. For one, it doesn’t provide a USB port to the front which could have helped with direct prints. Still, the USB port at the back can be made functional with a USB wire. The KYOCERA FS-1325 also makes a bit of noise when printing. What’s worse is that the Quiet Print mode that it comes with doesn’t do much to reduce the noise level. The maximum scanning resolution of this device also leaves a lot to be desired. It is rated to scan at a maximum of 600 x 600 dpi. 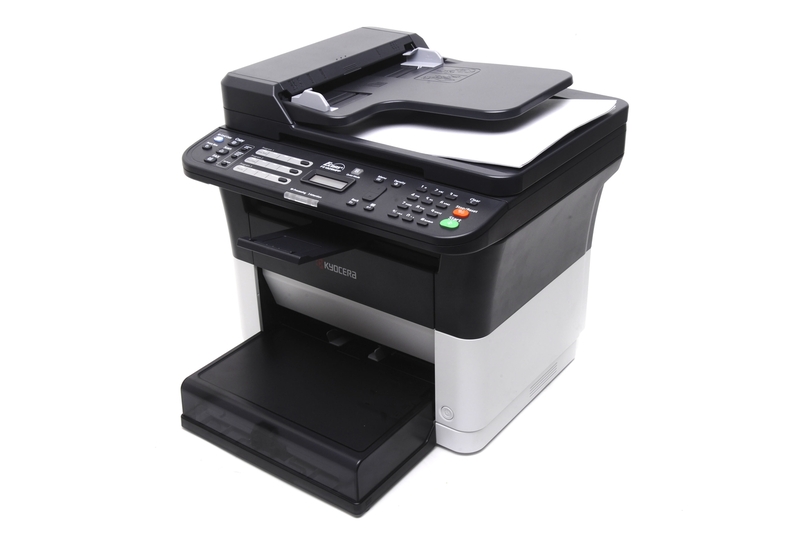 The paper capacity of the KYOCERA FS-1325 reflects its entry level category. The total paper capacity of this multifunction monochrome laser printer is 251 sheets which can be divided into a 250-sheet primary tray and a single sheet multipurpose tray. Additionally, there is also an Automatic Document Feeder (ADF) at the top which can hold about 40 sheets. While the KYOCERA FS-1325 doesn’t offer Wi-Fi Direct, the connectivity options it does offer are USB 2.0 and Ethernet. The inbuilt memory of this device is to the tune of 64MB and the first-page output is rated at about 8.5 seconds. With respect to physical controls, this device has a control panel on the top that features a two-line, 16-character LCD screen that is accompanied by a number of physical buttons to control the four functions of the device.